The food industry is very competitive. Right from the restaurant designs to the quality of the food, everything needs to be essentially differentiating to make a strong impact. 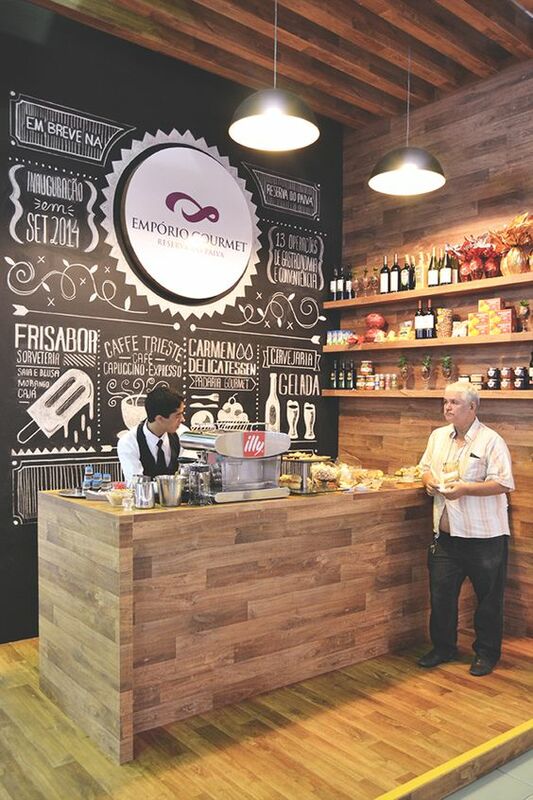 The murals and typographic artwork on the walls of cafes, restaurants and hotels are results of creative thinking, designing excellence and pre-defined inspirational storytelling. 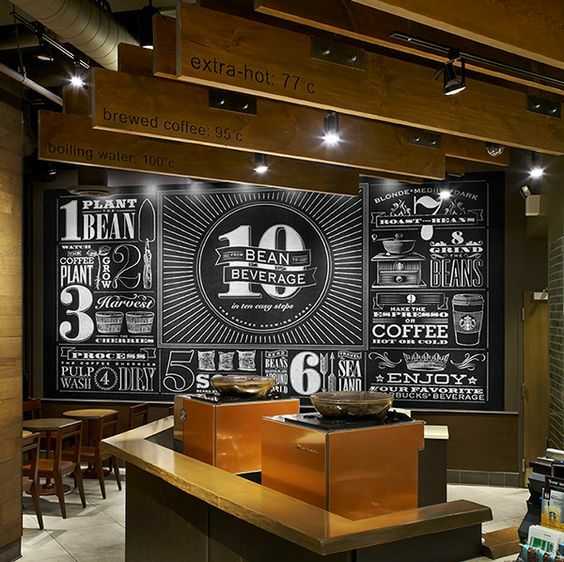 The concept of having designed walls with typographic art and such other forms of art is actually very appealing. 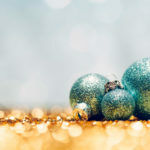 The core benefit behind using such tactics is to keep customers engaged and give a feeling to the customers that the restaurant has artistic touch added to it. Hare + Klein is Australian based interior design studio. It provides designing and wall art services to high end businesses and residents. 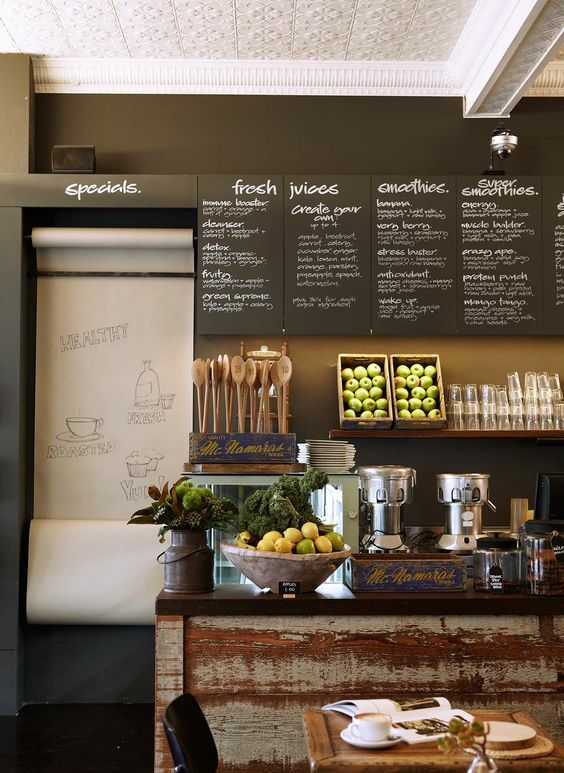 The craft and styling of this particular studio is very essential and it also evident from the art shown in the Bloom Café Mosman. Katie Perkins is the co-founder of Kaper Design. 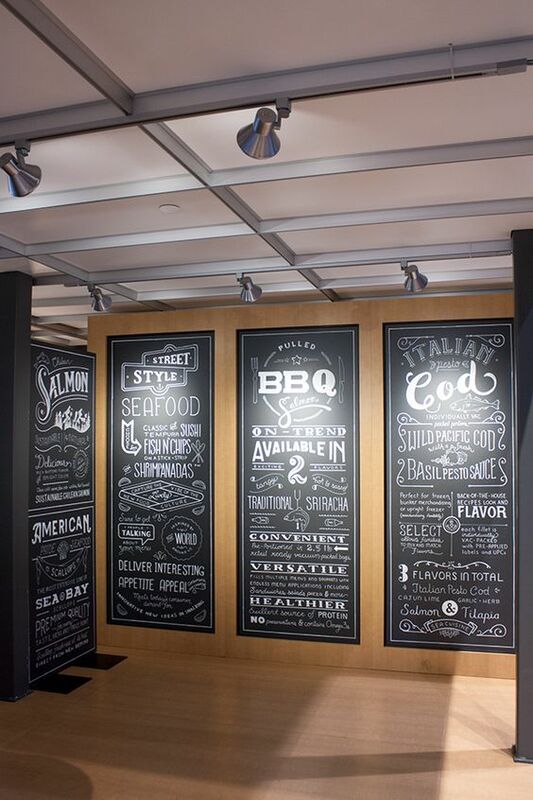 Kaper Design specializes in restaurant designing and wall art designs as well. The designs by Kaper Design are very vibrant, large sized and colorful. 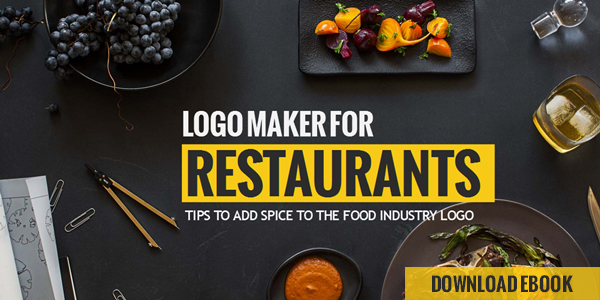 These qualities make their designs stand out in the restaurant and hotel industry. Marianne Girard designed the above shown wall of O Chevreuil. 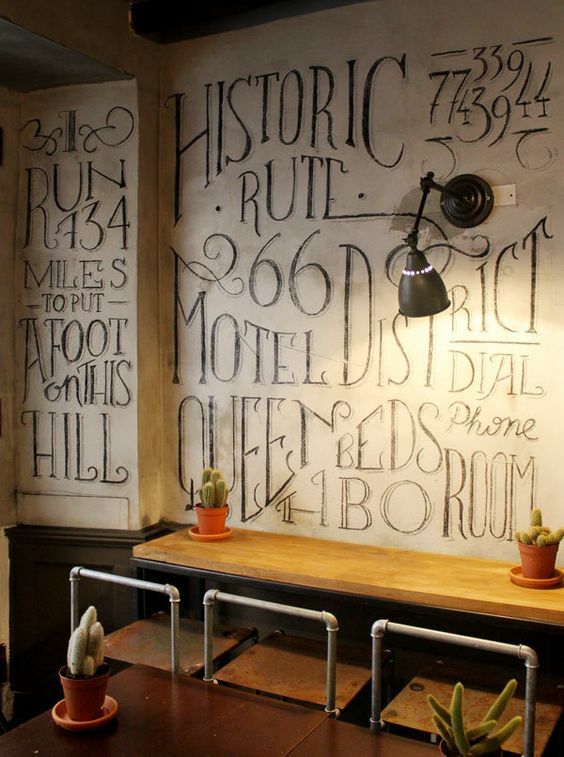 This is a great typography wall-art which gives a detailed and interesting combination of designs featured on the wall. 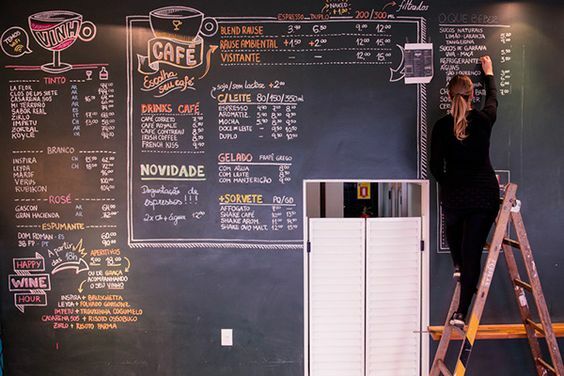 The chalk art is correctly used on the wall to give a thorough impact to the customers. The above shown wall art is designed by Paul Taylor. He is very detailed in his wall art designs and this is the beauty of his work. 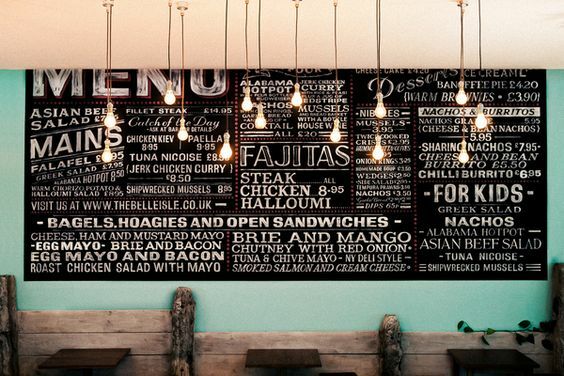 There are many wall arts designed by Paul but this wall art design for The Belle Isle is quite an eye-catcher. It is detailed and very accurate. Ryan Lee is a great chalk artist and loves to do wall art for businesses. 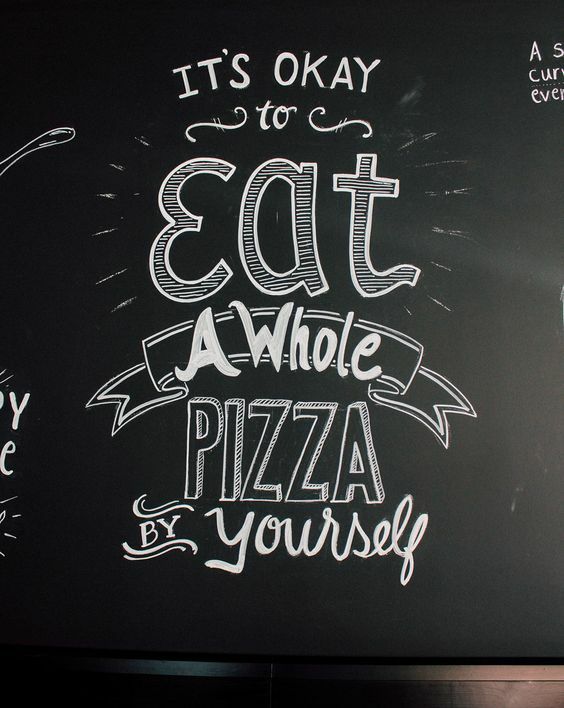 The image shown above is from TJ’s Woodfire Pizza. The beauty of this wall art is its simplicity and to the point message that is easily communicated to the target market. It is a great way to keep things simple and accurate. Louise Skafte is an advertising enthusiast and graphic designer with keen interest in the wall art. 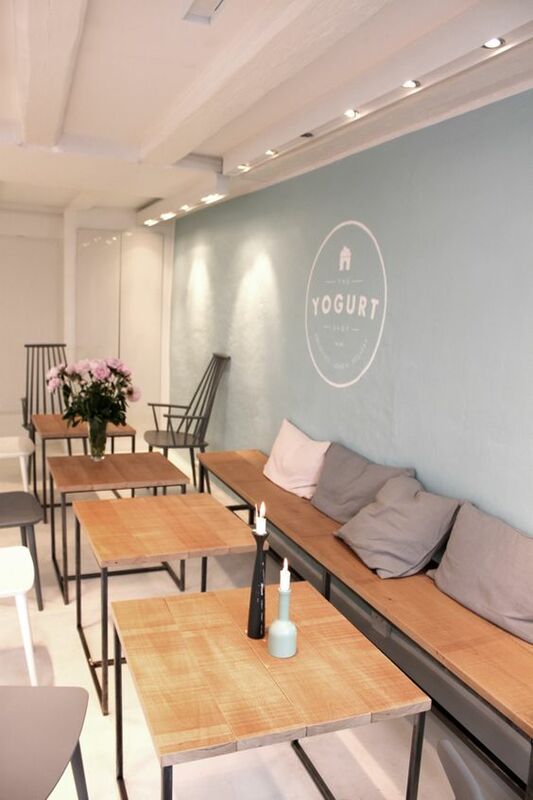 The above mentioned artwork is designed for The Yogurt Shop. The color combination, typographic elements and design sense share a great contrast of minimalism and effective branding. Csilla Biró loves music and wall art designing. 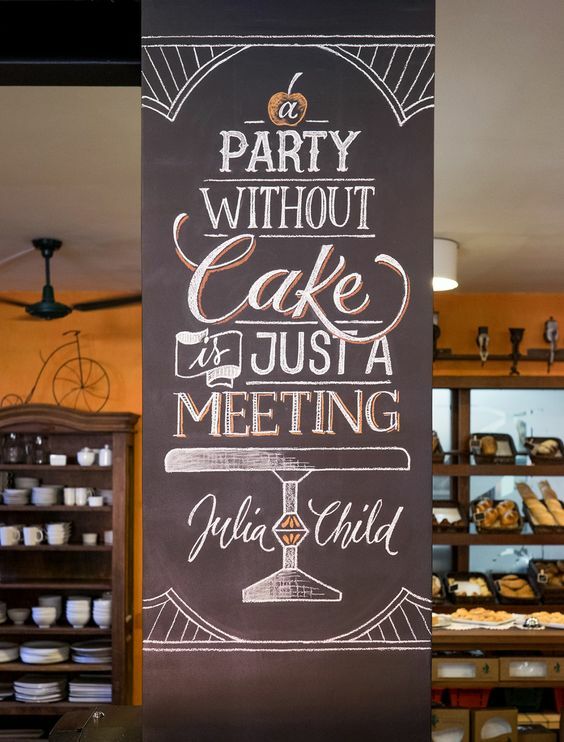 The design shared above is a nice example of typographic art and design with chalk lettering. This also encompasses the picture elements. 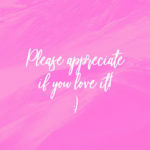 Cyla Costa is a very talented graphic designer and loves to play with the typography. She has created the wall art for the Prestinaria which is a very fine baker. The message and the typeface used are very relevant for the particular niche. The colors used in the wall art are also apt to the business industry. Tommaso Guerra is an interior designer and have special interest in wall art. His works are inspired from typography and this is why mostly display the large sized and creative typefaces. He has created wall art designs which are simple, creative and very creative. Kelsy Stromski runs Refinery 43 that is a design and lettering studio. She has an unconditional love for typography. This is the reason why she shows her love in her wall artworks. Her designs are very impressive and stylish. This is what which makes her work stand out. Lisa Nemetz is graphic designer with great interest for the wall art and typography design. Most of her wall art designs are inspired from old-age setting. This is the reason why her designs have certain feelings of older times. The typefaces are very catchy and bold, most of the times. Anya Garienchick is an interior design enthusiast. She is also interested in photography and architecture. 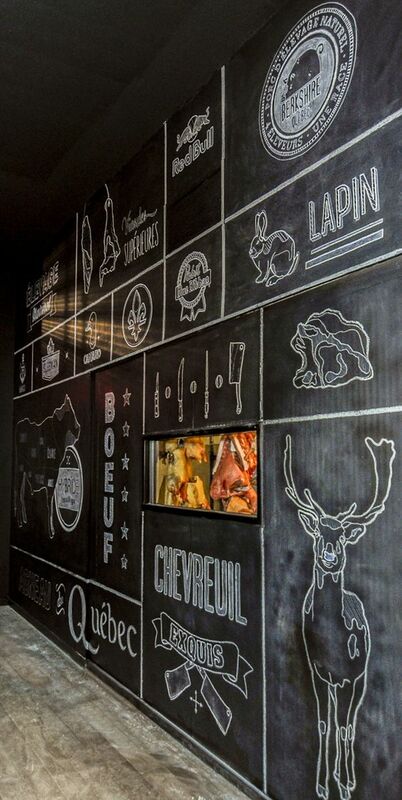 The wall art is for the Muzhiki bar which elaborates about the offerings and services available there. 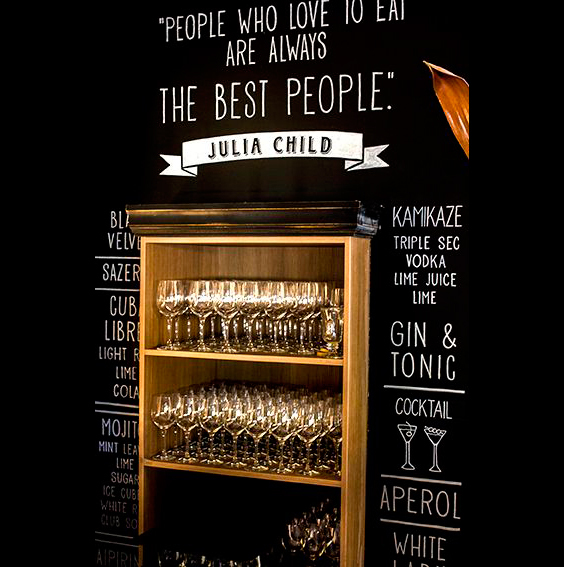 The Typographic artwork is essential and very suitable as per the bar’s niche. Cristina Pagnoncelli is a visual artist and designer. She is a very detailed artist which is evident from her wall art and other artwork examples. The above shown wall art for Rause Café is a great example that showcases her color orientation, typography art and designing skills. Jaymie McAmmond is based in Toronto and works as freelancer. She is an accomplished illustrator and graphic designer. Her artworks are very stylish and based on modern minimalist art. This is the reason why she plays with designs in a trendy way. 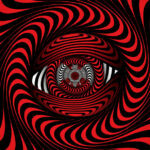 Julio Klenker is from Brazil and enjoys his designing and illustrations. He adds multiple instances to his design and this gives a colorful, high on design and engaging wall art. The typographic elements are simpler and easy to relate with. He has a flair for modern day design that is apt for the target audience. If you like to witness wall art with different strokes, images, pictures and sketches then you need to see the following video which vividly describes the design by the artist Joeel Lee for Happenstance Café. 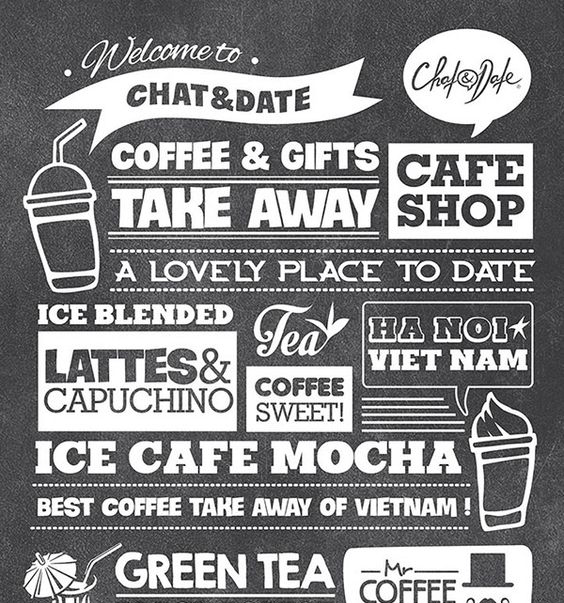 Hieu Trieu is a graphic designer and he has created the above shown wall art for the Chat & Date. It is obvious from the design that he possesses great skills for using different styles on typographic art in one art piece. 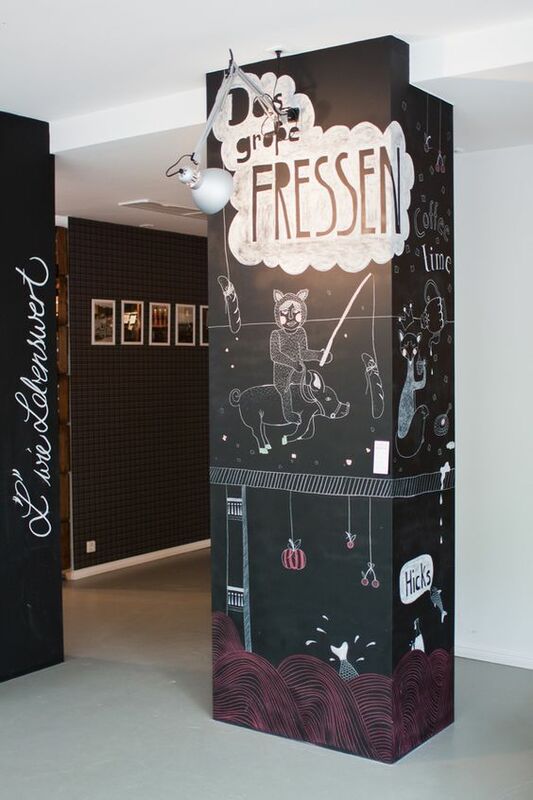 The wall art is a combo of multiple style of typography and amazing sketches. 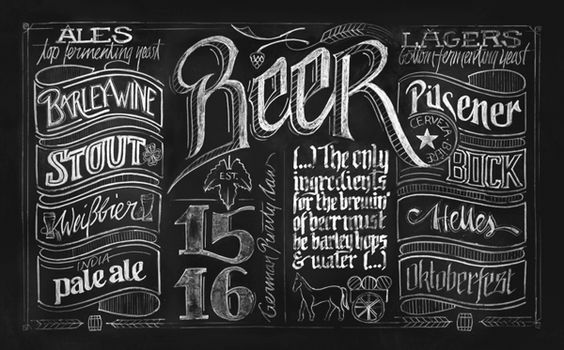 Igor Mustaev is a designer and letterer who is known for his aesthetics. 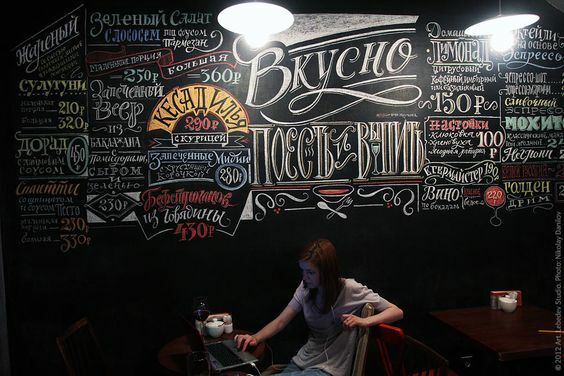 He has designed the wall art for Art Lebedev Café and it is one remarkable work from his end. The artwork comprises of stylish and chic typography along with multiple colors which take the artwork to the next level. 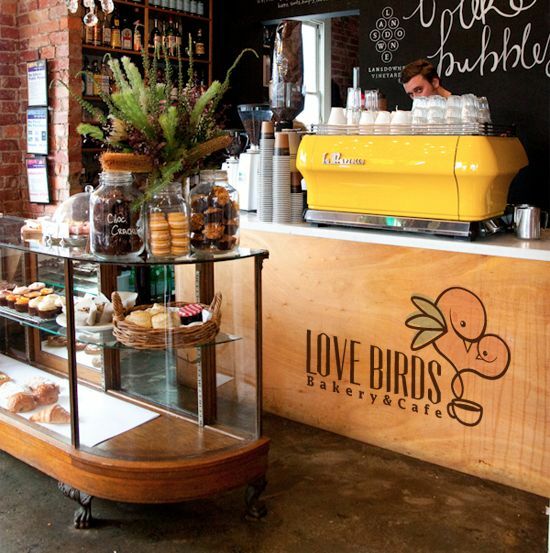 Carrie Chang is a graphic designer and has created the wall art for the Love Birds Bakery and Café. She is great with typefaces and loves to experiment with typographic art to add her personal touch to the art-piece. She is a Pinterest addict as well. Jordi Rins has created and designed the above shown wall art for El Maset. The artwork is impressive and bears variation of typographic art. 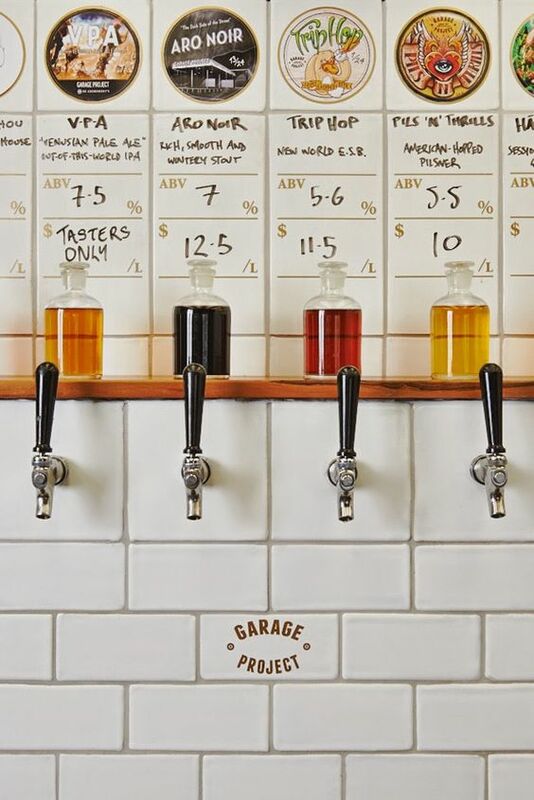 This makes him a typography enthusiast who always prefers to use different styles of writing in his wall art designs. Pamela Rama is an independent designer from Germany. She has designed the wall art for Ladenlokal, i.e. 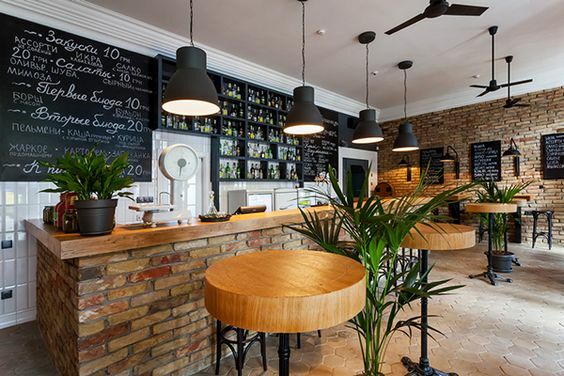 a restaurant. The chalk illustration is mind blowing as it shows interesting elements of design which are very authentic, bold and colorful. This kind of art work is very detailed and requires a lot of thought processing. 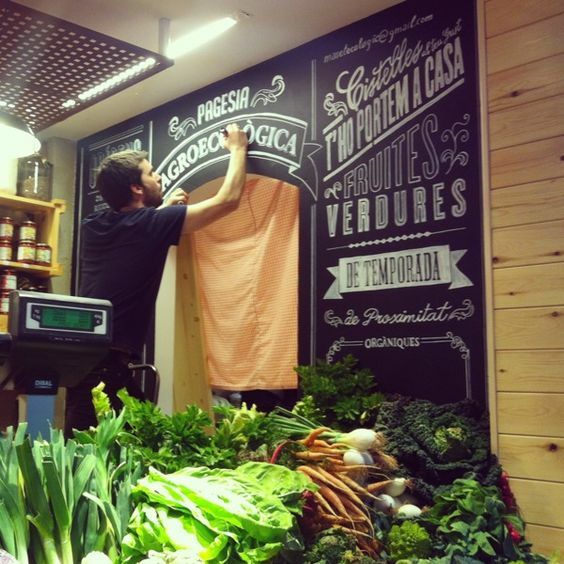 Typographic wall art for restaurants and cafes is very difficult yet very impressive. It takes a thorough designer and artist to create an unforgettable artwork. Share your best pick from these wall-arts or others which you might know.